We actively promote play as being essential to a child. Essential to their, social, physical, psychological, and cultural development. It is widely known that children learn through play. It helps them to become more independent, develop concentration and imagination and is a key skill needed for life. Play is fun, an essential part of child development, and something to be enjoyed by the whole family. We aim to be a place that offers a large range of well designed quality toys. A place that gives you the opportunity to borrow toys that match the stage of development that your child is at, a place to interact with other families. Whitby Toy Library first opened its doors on April 24th 1993. It had a membership of 60 families, ran from premises in the Whitby shopping centre and opened for 4 hours a week. There were 167 toys! and membership was restricted to the Paremata Plunket area and there was a waiting list. Much has changed since then. 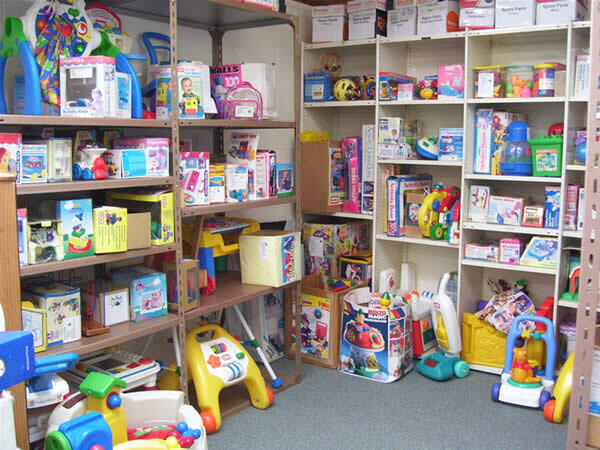 Whitby Toy Library now has its own premises located at Adventure Park Car Park, has a membership of 179 families is open 5 hours a week and there are now over 1400 toys. Furthermore anyone can join as their are no boundary restrictions or waiting list. Over the years, much fundraising has taken, not only to establish the toy library but to maintain and grow it. In 1992, over a period of nine months of fundraising, $10,000 was raised. Grants were received from Porirua Licensing Trust, Porirua City Council and the Hillary Commission. Cake stalls, sausage sizzles were held and Farmers Porirua adopted Whitby Toy Library as their charity of the year. Recent fundraisers include Entertainments Books and KiwiKlings. For more information about our toy library please click here.